Healthy and happy on my journey to lose 100 lbs. and reclaim "me" thru old fashioned weight loss and exercise... I've lost 115 pounds to date! C'mon and help motivate me, follow my progress! I love inspirational quotes and inspirational people even more! ... the night of nights. C'mon - you know the tune! Sing along with me 'cause I'm all excited to let you know that the February issue of First for Women has hit the newsstands! 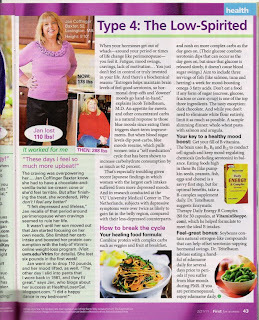 The photos and sidebar article about me are part of a larger article in the Health section of the magazine about overcoming addictions to carb and how to tell what type of 'carb addict' you are. 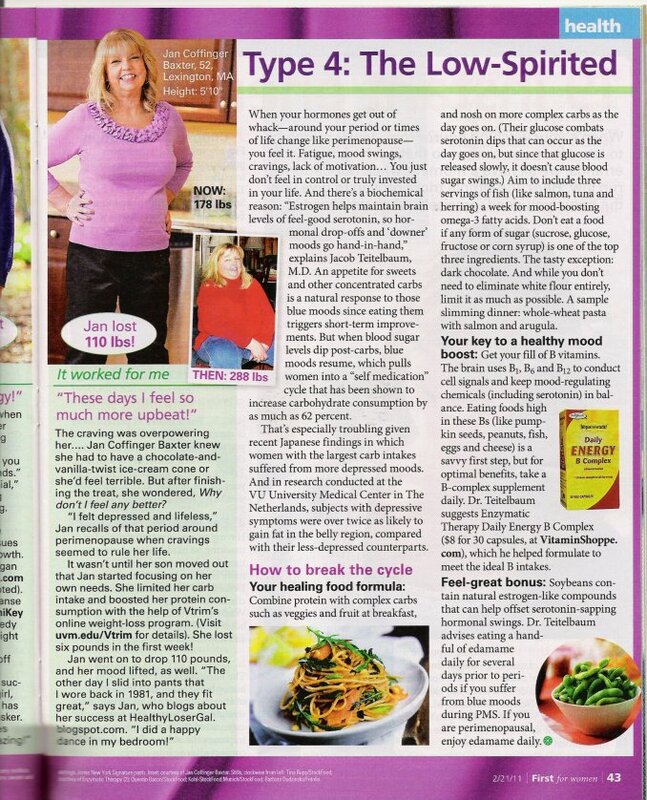 I am grateful that Lisa from First for Women magazine mentions Vtrim and the blog because without both this blog and the wonderful online Vtrim program, I doubt seriously I would be where I am and WHO I am today! Two other fun press mentions to report on, too... I am in the Boston Globe's Health section in a photo slide show of Boston area people who have lost weight. And, for whatever reason, each time they feature that slide show they keep showing my little "after" face (thankfully not the BEFORE!!) on the front splash page. I'll have friends say "hey, you're on Boston.com's front page again!". LOL Here is the link to the photo there. Do you read the articles on Diets in Review? I really like that site and they have resources like BMI and heart rate calculators, etc. Their articles are interesting and change all the time and they are active Tweeters, too, so that is fun! Okay, I have to run to the gym... I still have some weight to lose and a 5k run in May to get ready for! What? I haven't mentioned that... oh, I will. Dream. Believe. (Work hard) Achieve! Oh, the fun you're having from your hard work! That's awesome. Congrats. Wow, you in print!!! Very proud of you Jan!! Congratulations and keep up the great work!! i am going shopping for this magazine tomorrow!!! CONGRATS!!!!!!! You must feel simply superly amazing!!!! I am so glad to know you! whooooooooo hoooooooooooooo!!!!!! I am so excited ! And so proud of you! I am talking about you today on my show. Pick a date you want to be on!!! I rushed out and bought the magazine. It's a good issue too. Hey, I kind of know her - lol. Congrats on these wonderful articles! It has been inspiring keeping up with your story. This recognition will inspire others with their wellness journeys! Guess what I am doing right now! Just got home from the store- put a pot of coffee on , sand I am sitting down to read your story in the magazine! "The purpose of life, after all, is to live it... to taste experience to the utmost, to reach out eagerly and without fear for newer and richer experiences." Honored to be included in this Mamavation list! Feel free to email me at healthylosergal@yahoo.com Thanks! Did I Just Eat That Out Loud?